EXCLUSIVE: ‘Daily debates’ at CNN about Piers Morgan, Richard Davis ‘increasingly nervous’ – The Slog. The official line coming out of CNN remains the same: Mr Morgan’s phone-hacking denials have been firm and consistent, and the CNN management accepts them. But behind the bland corporate spin, The Slog has learned that the man in charge of ethics at CNN is very unhappy indeed. Tempers have been wearing thin in the top CNN echelons. Jon Klein, the man who championed Morgan’s hiring, is no longer there. Several of those who didn’t are less than happy to find that the British Larry King ‘replacement’ is not quite the harmlessly cheeky tabloid journalist they were sold six months ago. And a key senior player at CNN, Richard Davis, is understood to be increasingly nervous about the Piers Morgan situation. This is perhaps unsurprising, because Davies the news network’s executive vice president of News Standards and Practices. ‘Tabloid’ is what influential factions in the CNN management team are more than happy to be nowadays. But not if it involves them facing the same rub-off suffered by Rupert Murdoch. And at the same time, other factions are unhappy about being tabloid if it alienates too many solid viewers. “The focus groups are equivocal about Morgan” says one US media insider, “and traditional CNN fans aren’t happy to be fed a diet of celebrity life episodes. Piers Morgan is not widely seen as a success in CNN. In some parts of the building, he’s seen as an accident waiting to happen”. The views of the anti-Morgan camp have been hardened by news over the last two days that their new chat anchor may wind up in the same Committee room as the Murdochs – and face at least four civil cases. It’s also just beginning to dawn on some top movers in CNN that the UK Leveson inquiry will put Morgan on the front pages for all the wrong reasons. More clouds seem, however, to be on the horizon: James Hewitt is to sue MGN and Morgan for a particularly murky episode in which it is alleged that Piers Morgan wound up in possession of stolen letters. And Paul McCartney is said to be mulling a visit to Plod on the subject of a telephone conversation with the former Mirror editor going back to the days of his courtship with Heather Mills. At the end of the day, CNN remains a pretty strait-laced corporate entity. The prevailing view now among US media opinion leaders is that, as one person put it to the Slog yesterday, “Piers just isn’t successful enough to survive this kind of stuff. Frankly, he isn’t worth that much to CNN”. Previous Previous post: HACKGATE DAY 202: Can we please focus on the Mirror Group horse – before it bolts too? Did anyone see last night’s BBC1 prog. “The Celebrity Apprentice USA”? I decided to watch it because of all the media speculation about ‘Arse Romping’ and it was there for all to see, the worm in action. He set up a member of his team to spy on their female rivals. It was boring as hell with all the American power-speak but it was very interesting to observe Morgan carrying out his devious deeds,with schoolboy glee, trying to be so clever & wily. However, he just showed himself for what he is, a cheap & nasty, arrogant buffoon. When his actions were revealed, the general concensus of opinion in the boardroom by the other contenders, plus Trump & his offspring, was that he was guilty of Corporate Espionage/and or/ Sabotage, they couldn’t quite make up their minds. And this is all on camera! It was lovely to watch him squirm after thinking he was being such a smart arse. Catch it on bbc/ i player and a copy should be sent to Vaz & his mob, although Vaz would probably find it all perfectly acceptable. Audacity is the Romping Arse’s watchword but that won’t do him much good when they finally bring him to book. He won’t get a job as a kitchen porter at Trump Towers when the Karmic Wheel finally lands on his smug head. Don’t they have access to Youtube, these CNN top men? A quick browse to here would have had them appraised of the potential folly of employing him. No sympathy at all here. I mean, you just don’t do you? 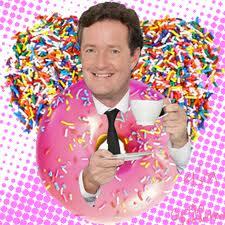 In the immortal words of John Nance Gardner ‘ that Piers fella ain’t worth a bucket of warm spittal’.